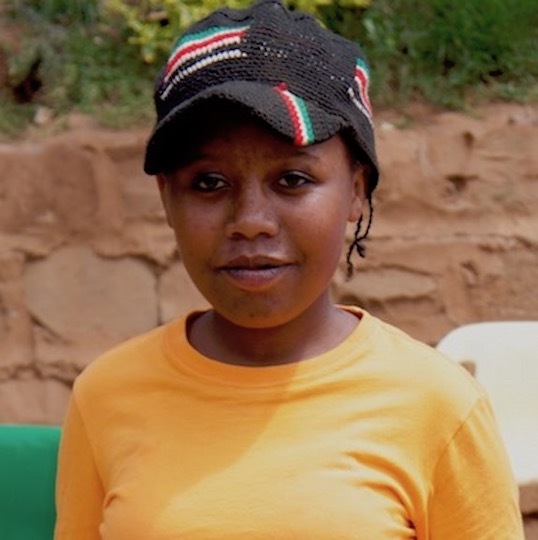 Doris is a jovial 16-year old, currently enrolled in Form 2 at Fr. Heeran Secondary School. She serves as assistant captain on her school’s football team, and scores well above average grades. Doris is thriving, despite her troubled background. The Moja Tu team first caught up with Doris in class 8, where she lived with her single father who not only refused to acknowledge her as his child, but also mistreated her by forcing her to go into child labor. Our team, in collaboration with local law enforcement agencies, rescued Doris and placed her in one of our partner children’s homes, the Sons of Manaseh. During her time away from school, Doris lives at this home, and visits it on her school holidays. Due to the trauma caused by her mistreatment at the hands of her father, the Moja Tu team and Fr. Heeran management established a therapy routine to help Doris process, accept, and move on from her difficult past. Doris undergoes constant guidance and counselling, with both the administration at Fr. Heeran and with Moja Tu during her holidays. Over the last three years that Doris has been with Moja Tu team, we have seen her transform into a responsible, focused, and self-driven girl. We hope that with her love for science subjects such as Biology and Chemistry, she will get a good education that will enable her to achieve her life-long career goal of being a doctor.